The Solaris Editors' Blog: This is the dawning of the Age of ... Aztec?! This is the dawning of the Age of ... Aztec?! Native American civilisations and blazing semi-automatics? 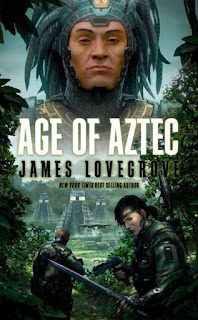 It can mean only one thing - we're celebrate the impending UK release of the latest in James Lovegrove's Pantheon series - Age of Aztec! There's not exactly any "harmony and understanding, sympathy and trust abounding" in this vision of worlds dominated by ancient gods made real that has sold an astounding 100,000 copies worldwide!! Already available in the US and Canada, Age of Aztec has already garnered rave reviews. The Guardian said Age of Aztec is "higher on action and violence than Lovegrove's previous books, the novel still manages to portray convincingly the psychology of its two antiheroes and paint a vivid picture of Aztec lore". Sci-Fi Bulletin called it "a thoroughly engrossing novel, with well-written chase sequences that feature people about whom we care – we may not always like them, but we’re always invested in them – and some epic battle scenes. If you enjoy techno-thrillers with a twist, you’ll like this" and gave it 8/10! And Elitist Book Review loved it even more: "Rarely ever does a novel surprise me in terms of plot direction (call me jaded) but this book got me with not one twist, but two. I had no idea how the book would finish until the fantastic ending." The books are the latest in the best-selling Pantheon series - a thematic series of related, but stand-alone novels which addresses the theme of “men versus the gods” in different worlds, with different pantheons, offering different takes. A breathtaking series that is not to be missed, last year's The Age of Odin went straight onto the New York Times' bestsellers list. All high-action military SF books, the series has presented an armed uprising against distant but powerful Egyptian divinities, a high-powered slugfest between battle-suited humans and super-heroic Greek gods, and a gritty, intimate firefight between an infantry company and an army of ancient Norse giants. In Age of Aztec, Cortez’s brutal suppression of Mexico never happened and the Aztec Empire rules the world. Yet in jungle-infested London, a masked vigilante defies this cruel and ruthless oppressive regime: the Conquistador. As the apocalypse looms, he must help assassinate the mysterious and immortal Aztec emperor, but police detective Mal Vaughn is hot on his trail, determined to bring him to justice. If you're in the UK or Ireland, you can pre-order your copy of Age of Aztec right this second. Battle begins on 12th April and, really, after those reviews you'd be MAD to miss it. 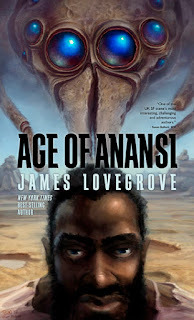 Also available right now is Lovegrove's e-novella, Age of Anasi, an e-book exclusive and a journey into a dark heart of deceit, lies and ancient gods! Dion Yeboah leads an orderly life... until the day the spider appears. What this ordinary-looking arachnid turns out to be Anansi, the trickster god of African legend, and its arrival throws Dion’s life into chaos. Lawyer Dion’s already impressive legal brain is sharpened. He becomes nimbler-witted and more ruthless than never before, both in and out of court. Then he discovers the price he has to pay for these newfound skills. He must travel to America and take part in a contest between the avatars of all the trickster gods. In a life-or-death battle of wits, at the end only one person will be left standing. Civilian Reader called it "brilliantly researched and put together, Age of Anansi is a great taste of the Pantheon series, and comes highly recommended". It's the dawning of the Age of the Pantheon - begin paying tribute now!